Is The Vampire Diaries Ending After Season 8? HackGh Community Forum » Non - Categories Topics » Is The Vampire Diaries Ending After Season 8? A few weeks after The Vampire Diarieswas renewed, star Ian Somerhalder hinted that the upcoming eighth season may be its last. "Can you believe this sh--? F---ing seven years! Isn't that crazy?" Somerhalder told TVGuide.com. "Because very few people I know have closed out a series - well, we're not closed out yet. We have another year now... [This morning] I just thought, 'Wow, man. You just navigated seven years, 154 episodes of television.' And by the time it's done, it's going to be 176 episodes, by this time next year." When asked point-blank if Season 8 would be the end for The Vampire Diaries, which already said goodbye to star Nina Dobrev last year, Somerhalder said he didn't know for sure. Either way, the actor said he views the upcoming season as an important opportunity for the show to recapture its former glory. "It's almost like we've been chasing a high for the last five, six years," Somerhalder explained. "Do you remember when Elena ran to the Salvator house and asked Stefan, 'What are you? What the f--- are you?' And he says, 'A vampire.' Do you remember how big that moment was? It was huge. And now, we have to kill six or eight people, blow up three cars and a house to get that same emotion. Do you know what I mean? "I would look at this season as being a very, very important time to notch up our belts and really put our big boy and big girl pants on in terms of telling stories that connect back to the ways this show [once was]," said Somerhalder. "I thought we were going to get to do it more this year. There's been some great storytelling, but I'm anticipating being able to get down to brass tacks, which was this very specific, wonderful core group of characters that navigated the treacherous waters of what is Mystic Falls." However, it appears as though not all our favorite characters will live to see Season 8. Somerhalder, who directed the upcoming April 1 episode, revealed that the "Days of Future Past" will feature a few painful farewells. "This one was really about telling the story of this whole group of individuals and how they're all intersecting. And we lost some very wonderful, very beautiful characters in this episode," Somerhalder said. "It was just about tugging on the heartstrings of the audience and really allowing them to feel these characters." Do you think The Vampire Diaries should end after next season? The Vampire Diaries returns Friday, April 1 at 8/7c on The CW. Gosh I really loved this series... and how to connected with my favorite Originals ... I have have all the seasons all my Lap form 1 - 7, its eating up my 2tb hard disk space thou ...lol but i jux love it and go back to watch some ld episodes when im bored.. It's the best series there is after prison break. That's my opinion tho but we would still have the originals to watch. I believe they might bring most of the characters from the V diaries to the originals. My favorite character is Damien. He is evil. 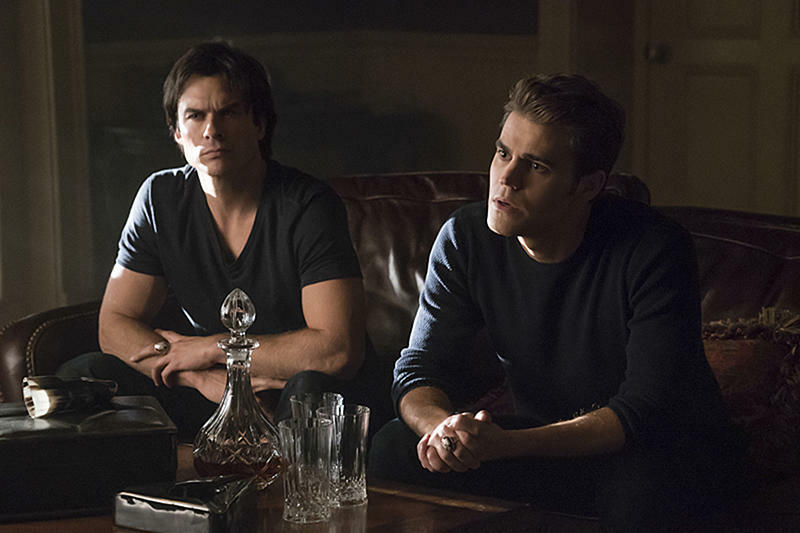 5 Re: Is The Vampire Diaries Ending After Season 8?